Every time I walk into an arcade in the mid eighty’s, the music to this game could always be heard coming from somewhere hidden in the depths along with the likes of Galaga & Rally X.
Pacland was released into arcades in August 1984 by Namco, and its American distributor Bally Midway (later Midway Games). It was later ported to several home computers & consoles including the Commodore 64, the Commodore Amiga, the Atari Lynx, the Atari ST, the TurboGrafx-16, the ZX Spectrum, the Amstrad CPC, the MSX, and the NES with the latter also available for the Wii U Virtual Console. I liked how they kept the some of the features of the original game but wrapped them up in a completely different world. I was a bit dubious at first but after playing it for a while, I could see you they went down this avenue with it. Compared to the likes of Montezuma’s Revenge and Jet Set Willy, Pac-Land fast, sleek & a breath of fresh air. Pac-Land is a side scrolling game featuring PacMan himself who is trying to save a little fairy that he carries with him hidden under his little red hat and has to return her to a garden where she turns back into the Mega Fairy (that’s a lie, I’m not sure where the fairy was being delivered to, but Mega Fairy will do). I could never understand how the level finished, it looks like some kind of kitchen door, secret portal type of thing that led to a floral shrubbery! You don’t often see game level ending quite like this! The Japanese release by Namco differed somewhat. 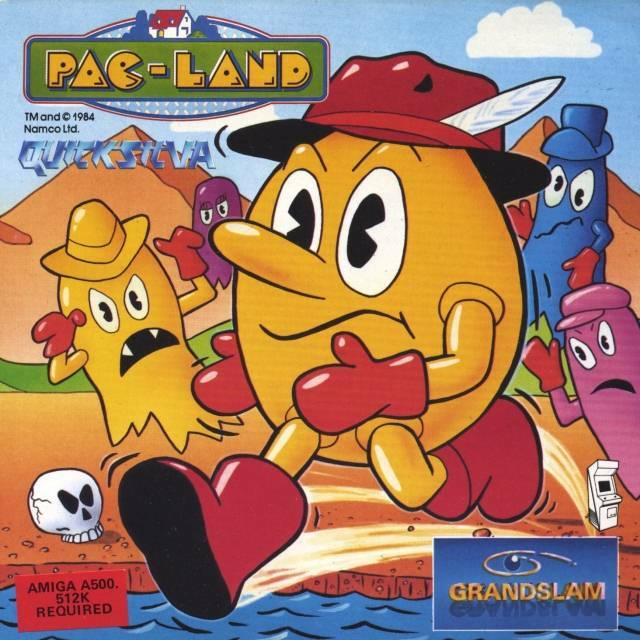 The Pac-Man sprite resembles the official artwork of the character but with a longer nose, Pac-Man-shaped eyes, and (for this game) a Tyrolean hat with a feather. The hard part about this game was the controls. You had a six axis joystick which you repeatedly tapped in the direction you wanted to go. Pressing the button made you jump and repeatedly pressing the button slowed your decent enabling to clear long jumps and water hazards. The problem with this is it doesn’t matter if it was when you were 16 in the eighties or even now in your 40’s, that button is never pressed with respect, the more frustrated you get, the more you quite literally hammered it! I’ve had many a strange stare at the arcade club trying to beat a friends score believe me. In the town section, you run along collecting cherries and other fruit whilst jumping over fire hydrants, cars (old ford model T’s) & even buses. like the original game, eating the Yellow power pills turns the ghosts purple allowing you to eat them for added points. Each level you will be chased by a pink ghost who homes in on you so you need to stay in front of him. Each level has to be finished before the time runs out! Secret power-ups could also be found, pushing a certain fire hydrant backwards would give you a special hard hat that would prevent little ghost being dropped from planes killing you! A little further comes the forest section where again you jump obstacles such as tree trunks, similar the the fire hydrants, pushing a certain one would release balloons for extra points or even turn you invisible and undetectable to the prowling ghosts. Further still would place you in a desert with the ghosts flying up & down in what look like ufo’s, quicksand, rotating logs with some moving up and down. The hard part here is jumping the pools with the helps of a spring board. Repeatedly hitting the controller to the right and smashing the jump button truly is a hand wrecker! There’s also a level section that varies as the game progresses. In the first, you have to collect keys to open doors so you can progress forward. During this you can collect fruit for added points but the key to this is watch your time as a few wrong moves and the time runs out will cost you a life! Further on and this level sees vertical jets of water trying to blow you off the top of level, combine this with horizontal water bullets blasting you across the screen and it makes for some tough gaming. After each of these levels, the journey back is greatly helped with the aid of a pair of magic flying boots given to him by the fairy queen for getting her safely home. With these boots its not long before you’re also back home to the Pac-family. A hidden item (sometimes accidentally dropped by the ghosts) is a Flagship from Galaxian, which rewards 7650 points when collected, (a reference to Namco’s goroawase number of 765). The Galaxian Flagship is a long running cameo that appears in the Namco-made Pac-Man games, however this is something that I’ve not yet come across! Commodore 64: POKE 5711,165 enables unlimited Mega-jumps. Hidden Warp: First, make sure you’re in Round 2. Move a tree stump (There’s only one in the level that you can move) and you will warp to Trip 3 Round 9, and earn an additional 80,000 points (Arcade and Atari Lynx versions only). be invulnerable for the entire level! Level 3: After getting your magic boots, push the third cactus on the way back for a free life. – Only use power pills when ghosts are in range, or else it is wasted. Nice write up this. 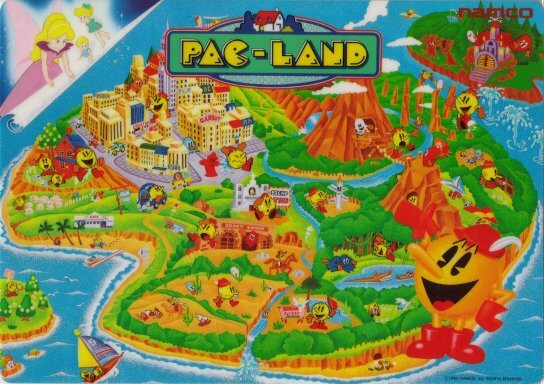 I never really paid a great deal of attention to Pac-Land. Had no idea there was so much depth to it. I like these games with hidden things to find (like moving the fire hydrant, and the hidden nod to Galaxian). Cool!